Did you realise that it is a legal requirement for you to change the classification on your V5C when you have completed your conversion. Some DIYers don’t and others are confused as to what they need to do. The DVLA have now added a requirement that in order for the campervan or motorhome to be registered as a “Motor Caravan” it must have the external appearance to match this description. This is a quote from an email from the DVLA confirming this to us. When describing the external appearance of a vehicle DVLA applies a ‘reasonableness test’ which is based on how a member of the public or police would describe the vehicle in traffic or if parked on the road. This is a longstanding procedure. Whilst vehicles kept or used on public roads in Great Britain must meet both domestic and European regulations such as Type Approval, DVLA body type descriptions are a separate entity to approval requirements. There is a clear consensus from the Police that the body type should reflect the outward appearance of a vehicle rather than its internal fixtures and fittings. As a result only vehicles first registered as motor caravans or those fitted with a custom coach built bodies, in addition to meeting the internal ‘checklist’ should be described as ‘motor caravan’ on the V5C. First of all the good news, it doesn’t cost you anything ie when you submit your V5C log book to the DVLA they don’t expect a fee and the other good news is that in the long run changing the classification shown could save you a bundle. Your road tax should be lower, depending on the weight classification your MOT class will become lower and the cost of an MOT cheaper, your campervan insurance will be cheaper and on the open road you can go 10 MPH faster than a commercial van. You might not want to go faster but that could save you from a speeding ticket if you drift off after a navigation argument with the missus. So when does your van become a Motor Caravan (yes I’m afraid that your campervan or motorhome is classified as a “Motor Caravan” in the eyes of the DVLA. Your van becomes a motor caravan when you have completed it and it has all of these minimum features fitted. The DVLA are interested in the vehicle being in the “correct body type classification” and this means that in addition to having the required minimum features it must also have “the external appearance of a “Motor Caravan”. See the bottom of this page for the Department for Transport definition of “Motor Caravan” which is used for imports. There must be a door that provides access to the living accommodation. A bed, which is an integral part of the living quarters which has a minimum length of 1800mm or 6 feet. This can be converted at night from seats used for other purposes during the day but must be permanently fixed within the body of the vehicle. There must be a water storage tank or container on or in the vehicle. A seating and dining area, permanently attached to the vehicle. The table may be detachable but must have some permanent means of attachment to the vehicle. It’s not good enough to have a loose table. There must be a permanently fixed means of storage, a cupboard, locker or wardrobe. There must be a permanently fixed cooking facility within the vehicle powered by gas or electricity. There must be at least one window on the side of the accommodation. Once you have got to the completed stage you can’t just send in your V5C with section 7 completed with the words “Motor Caravan” they want to see proof and they want to see that proof in the form of photographs. 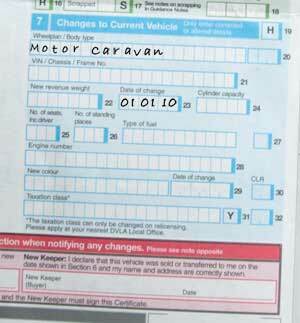 We have put together a detailed guide to all of this here: Motor Caravan Registration.